The definition of the ‘everyday’ begs to be re-examined, considering that the exhibition title wishes to superficially cover too broad a consideration for the range of works presented by the 8 artists. The range is indeed eclectic – from Gouache and Oil painted on the reverse of large, framed acrylic sheets (K.G. Subramanyan), a story about chairs, super flat paintings of smiling families (Farhad Hussain), profile paintings (Lalu Prasad Shaw), Soft renderings of water lilies that will contest Claude Monet’s (A. Ramachandran), lock stock 1.9m tall papier mache business men sculptures (Chintala Jagdish), and so on. Title aside, the selection of works may yield a couple of surprises for the local audience, questioning the over commercialised-complexity modus operandi of contemporary painting, simplicity in figures and shapes weaved with rich mythology, seen in A. Ramachandran’s “Birth of Palash Tree” (1992). Another gem of the show are the unassuming papier mache sculptures that suggests the artist’s interpretation of contemporary caricatures, like over-sized wooden dolls, and structural and sensitive use of papier mache, a material often used in children’s art. What’s startling would be the variety of skin tones rendered in angular shapes, on each doll’s face. Perhaps, it hints at a cosmopolitan appeal of urban life, or the melting pot effect of immigrants of different ethnicities. This perhaps contrasts with Lalu Prasad Shaw’s simple profile portrait paintings on a flat yellow background, where the ethnicity is undoubtfully Indian. The works do relate to a certain serenity, quite detached from the feeling we may get from imagining India, or walking through little India (Serangoon road, Singapore)on Sunday evening. It is this detachment that is uncomfortably unreal, and un-imagined. While the individual styles of the artists do show up quite differently and strongly, it serves as a tough comparison with the more compelling pieces, in scale and subject matter, in the BIG PICTURE SHOW, found in the Museum’s other gallery. Widayat’s retrospective may seem distant to some, in terms of his esteem position in Indonesia art and his bearing from traditional indigenous Southeast Asian crafts and works by early western modernists. This exhibition is important because it charts quite thoroughly, an Indonesian modernist’s linearity of artistic creation from patterns of natural forms, Western art influences, realistic representation, abstraction and media experimentation. A distinction is made by the manner which the exhibits are displayed, and the walls colour coded and distinguished by wall text, explaining the curator’s perspective of the merit of that ‘period’ of artistic creation. The palettes of his paintings are mostly sombre and earthy, with the kind of obsessive, compulsive detailing in the larger works; themes swinging between individualistic symbolic representations of the landscape, to social commentaries of a post-colonial Indonesian society. In the tradition of symbols bearing special meaning in the crafts used during traditional ceremonies, the personal symbols used by the artist could have been embodied to cleanse as well. The exhibition is also important because it might shed insight into any artist’s creation cycle, oscillating between figuration and abstraction – the state of which is independent of the artist’s age. It adds to a pattern we recognise as genius – sheer hard work, diversity and obsessive compulsion to create and innovate. The title “between Worlds” then suggests the journey the artist may have taken between the reality of unrest stricken civil society in the 1950s, and his personal world surround by his artistic vision. 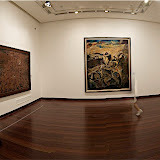 Lastly, the exhibition serves as a comparison to better known Indonesian artist Affandi (1907 – 1990), which is on exhibit at the Singapore Art Museum (October 19 – November 18, 2007).